FITC conjugated Mouse anti Human CD58 antibody, clone MEM-63 (MCA2126F) used for the evaluation of CD58 expression on B cells by flow cytometry. CD23hiCD58+ cells proliferate and constitute the bulk of the population by day 30. A. Carboxyfluorescein diacetate, succinimidyl ester (CFSE)-labeled B cells were exposed to EBV and harvested on day 5. CD58+ cells or CD58- cells were examined for proliferation and intracellular expression of IL6 (using APC-anti-IL6 antibody). Percentages represent fraction of gated cells (CD58+ or CD58-) producing IL6. G0-3 represents non-proliferated cells (G0) and three generations of progeny (G1-3). Percentages above G0-3 indicate the fraction of CD58+ or CD58- cells in each generation. B. EBV-exposed B cells were harvested on days 5, 6 and 7, and examined for expression of CD23 (PE) and CD58 (PE-Cy7). Percentages represent fractions of cells in regions R1 (CD23loCD58-), R2 (CD23loCD58+), and R3 (CD23hiCD58+). C. In a separate experiment, EBV-exposed cells (top panels) were harvested on days 4, 5, 6, 7, 10, and 30 and un-infected cells (bottom five panels) were harvested on days 4, 5, 6, 7, and 10 and examined for expression of CD23 and CD58. Percentages of cells in regions R1, R2, and R3 are shown. EBV-exposed cells harvested on day 30 and stained with PE and PE-Cy7 isotype control antibodies are also shown. D. CFSE-labeled B cells were exposed to EBV, harvested on day 5, and examined for expression of CD23 (PE) and CD58 (PE-Cy7). Cells in region R1, R2, and R3 were examined for proliferation and expression of IL6 (APC) by flow cytometry. Percentages represent fraction of cells in regions R1, R2, or R3 that produced IL6. Percentages above G0-3 indicate non-proliferating cells (G0) and proliferating cells (G1-3). 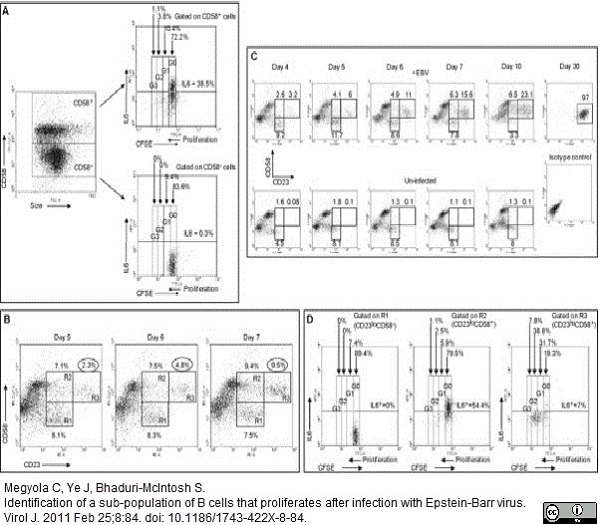 From: Megyola C, Ye J, Bhaduri-McIntosh S.
Identification of a sub-population of B cells that proliferates after infection with Epstein-Barr virus. Virol J. 2011 Feb 25;8:84. Emergence of distinct sub-populations of B cells expressing CD23 and CD58 following exposure to EBV. 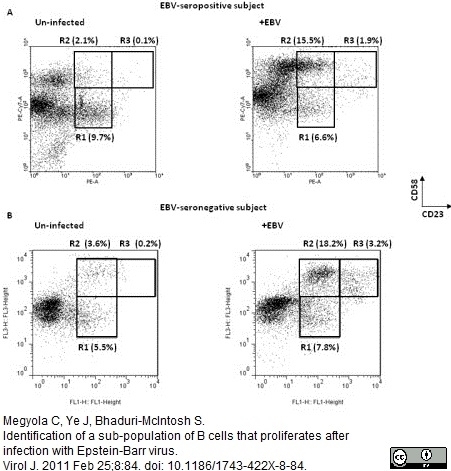 B cells from a representative healthy EBV-seropositive (A) and a representative healthy EBV-seronegative (B) subject were un-infected (left panels) or exposed to EBV (right panels) and placed in culture. Cells were harvested on day 4 and examined for surface expression of CD23 and CD58. Percent cells in regions R1 (CD23loCD58-), R2 (CD23loCD58+), and R3 (CD23hiCD58+) are shown. CD23hiCD58+ cells do not proliferate in the absence of EBV-exposed non-proliferating sub-populations of cells. Three days after exposure of CD3-depleted B cells to EBV, CD23hiCD58+ cells, representing 0.5% of the culture (A) were FACS-sorted. Post-sort analysis of CD23hiCD58+ cells is shown in B. Sorted CD23hiCD58+ cells were mixed with un-infected autologous primary B cells (as feeder cells) and re-introduced into culture at 0.5% of the total culture. Mock-sorted cells were also re-introduced into culture as control. Cells were harvested four days later and stained for CD23 (PE) and CD58 (FITC). Un-infected cells (C), EBV-exposed cells (D), mock-sorted but EBV-exposed cells (E), and sorted-CD23hiCD58+ cells mixed with un-infected B cells (F) after a total of 7 days in culture are shown. Percentages represent fraction of CD23hiCD58+ cells out of total. CD23hiProliferating CD23hiCD58+ cells and non-proliferating CD23loCD58+ cells express EBV latency genes. 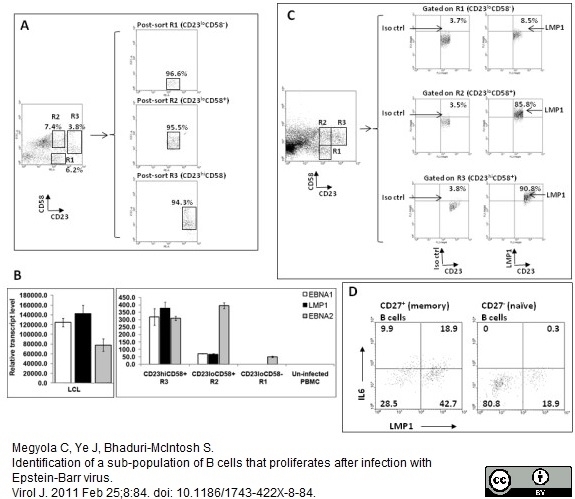 A. EBV-exposed B cells were FACS-sorted on day 4 into regions R1 (CD23loCD58-), R2 (CD23loCD58+), and R3 (CD23hiCD58+). Sorting strategy and purity of each population are shown. Regions were drawn with spaces in between to prevent contamination between regions. B. The relative transcript levels of latency genes EBNA1, LMP1, and EBNA2 in each of the three sorted sub-populations were determined by real-time reverse transcription-PCR (qRT-PCR) with gene-specific primers. RNA from already immortalized cells (LCL) from the same subject was used as positive control while RNA from un-infected PBMC from the same subject was used as negative control. C. EBV-exposed B cells were harvested on day 3 followed by staining for CD23 (PE), CD58 (PE-Cy7), and intracellular LMP1 (FITC) and flow cytometry. Expression of LMP1 in cells gated on R1, R2, and R3 is shown. Percentages represent fractions of gated cells expressing LMP1 or detected by the corresponding isotype control antibody. D. Sorted CD27+ memory and CD27- naïve B cells as in the experiment shown in Fig. 5B were exposed to EBV, harvested on day 5, and examined for expression of intracellular IL6 (APC) and LMP1 (PE). Numbers represent percentages of CD27+ memory or CD27- naïve B cells. Mouse anti Human CD58 antibody, clone MEM-63 used to evaluate CD58 expression in mucosal tissues by immunohistochemistry on formalin fixed, paraffin embedded tissue sections. 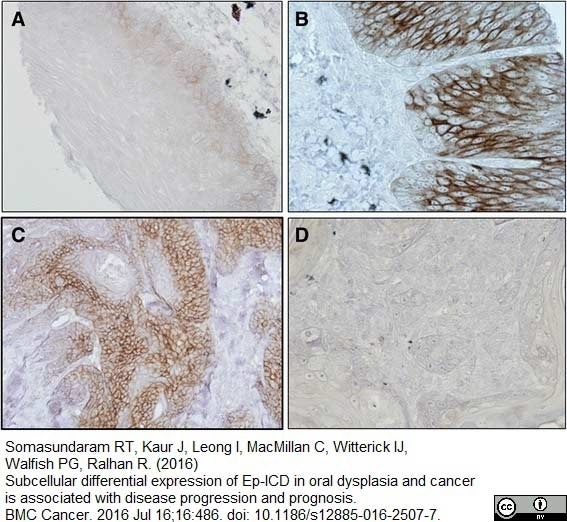 From: Somasundaram RT, Kaur J, Leong I, MacMillan C, Witterick IJ, Walfish PG, Ralhan R.
Subcellular differential expression of Ep-ICD in oral dysplasia and cancer is associated with disease progression and prognosis. BMC Cancer. 2016 Jul 16;16:486. Mouse anti Human CD58 antibody, clone MEM-63 recognizes human CD58, also known as LFA-3. CD58 is a membrane glycoprotein of ~55-70 kDa. It occurs in two forms, one transmembrane with a cytoplasmic domain, the other form anchored in the membrane via a glycosylphosphatidylinositol tail. The complete amino acid sequence of both forms has been deduced from cDNA. CD58 is a heavily N-glycosylated cell adhesion molecule which plays a critical role in facilitation of antigen specific recognition through interaction with CD2 on T lymphocytes (Macgoba et al. 1989). CD58 has a wide tissue distribution, being present on erythrocytes, platelets, monocytes, a subset of lymphocytes, bone marrow cells, epithelium and endothelial cells. There are approximately 5,000 CD58 molecules on each erythrocyte. There is reduced expression of CD58 on haemopoietic cells in individuals with paroxysmal nocturnal haemoglobinuria. Use 20ul of the suggested working dilution to label 106 cells in 100ul. Makgoba, M.W. et al. (1989) The CD2-LFA-3 and LFA-1-ICAM pathways: relevance to T-cell recognition. Immunol Today. 10 (12): 417-22. Shaw, S., Johnson, J.P., (1989) In Leucocyte Typing IV: White Cell Differentiation Antigens. Edited by Knapp, W., Dorken, B., Gilks, W.R., Rieber, E.P., Schmidt, R.E., Stein, H. and von dem Borne, A.E.G.Kr. Oxford University Press. pp 714-716. Grundy, J.E. et al. (1993) Increased adherence of CD2 peripheral blood lymphocytes to cytomegalovirus-infected fibroblasts is blocked by anti-LFA-3 antibody. Megyola, C. et al. 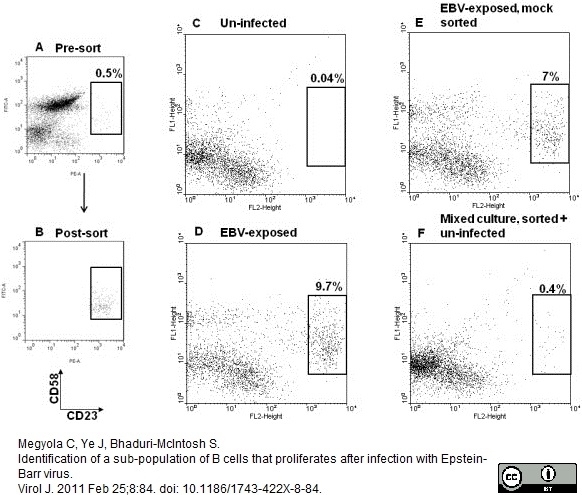 (2011) Identification of a sub-population of B cells that proliferates after infection with Epstein-Barr virus. Somasundaram, R.T. et al. (2016) Subcellular differential expression of Ep-ICD in oral dysplasia and cancer is associated with disease progression and prognosis.